Promo. Curve Leicester and touring. The Cat In The Hat. – East Midlands Theatre. 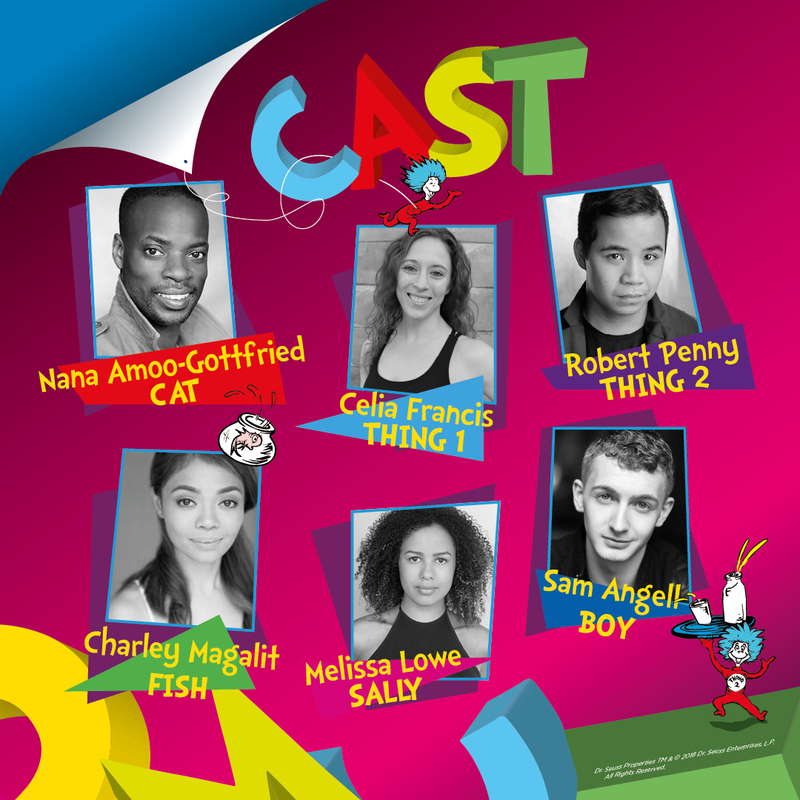 Playing at Curve in Leicester over Christmas 2018, this family production is created in association with the National Centre for Circus Arts and will feature Nana Amoo-Gottfried (A Winter’s Tale, Theatre for Younger Audiences at The National Theatre) as the show’s chaotic Cat, while actor and opera singer Charley Magalit (Mickey and the Wondrous Book, Walt Disney Company) will play the role of the fearful Fish. Joining the cast as the children whose house the Cat visits are Sam Angell (Billy Elliot – the Musical, Victoria Palace Theatre) as the Boy and Melissa Lowe (Me and My Girl, Chichester Festival Theatre) as Sally. Completing the company as the Cat’s energetic companions Thing 1 & Thing 2 are acrobats Celia Francis and Robert Penny. After entertaining families and creating chaos in Leicester, the production will tour across the UK, visiting theatres in Aylesbury, Edinburgh, Liverpool, Oxford, Birmingham, Tunbridge Wells, Southampton and Newcastle, before ending the tour at Rose Theatre Kingston 10 – 21 Apr 2019. Full details of the tour can be found below. Directed by Suba Das, set and costumes will be designed by Isla Shaw (The Witches and The Importance of Being Earnest, both at Curve and Playing Shakespeare: Macbeth, Shakespeare’s Globe). Helping to fill the production with circus stunts as Associate Director is circus choreographer Jack Horner, who previously performed in Curve and Rose Theatre Kingston’s 2016 production of Roald Dahl’s The Twits and recently worked as Circus Captain on Chess at The London Coliseum. Following the success of Curve and Rose Theatre Kingston’s previous co-production of Roald Dahl’s George’s Marvellous Medicine, Curve Associate Artist Tasha Taylor Johnson will once again join as Composer, providing 10 original songs. Based on the much-loved book by Dr. Seuss that has captivated generations of readers, The Cat in the Hat features feline frivolity aplenty. With acrobatic accomplices Thing 1 and Thing 2, riotous rhymes, infectious humour and spectacular circus, this family production is set to delight young and old alike. “We are positively purring with pride to welcome our extraordinarily talented The Cat in the Hat cast to Curve this Christmas. 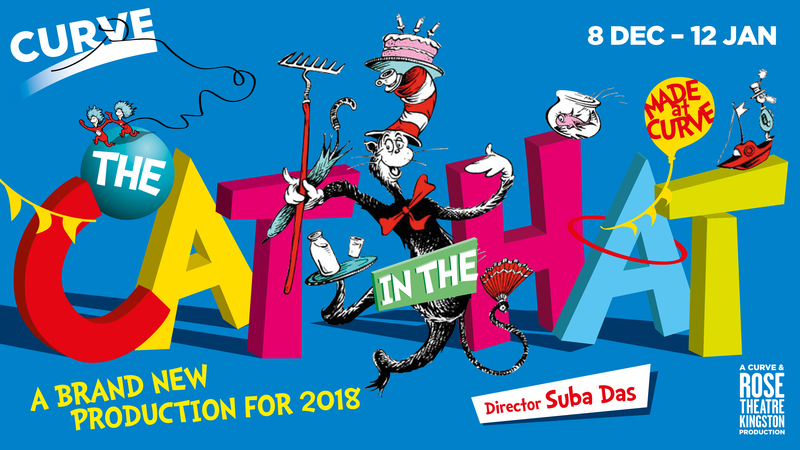 We are looking forward to working with Nana, Sam, Celia, Melissa, Charley and Robert enormously, as they create this brand new production of Dr. Seuss’ most iconic character. And with brand new songs by Curve’s very own Tasha Taylor Johnson, it promises to be a cat-tastic extravaganza. Once again, we are thrilled to be collaborating with our friends at the Rose Theatre Kingston on this production. “Last year saw Curve’s most successful year on tour to date, with one million people seeing our work at home in LE1 and on the road both across the UK and internationally, with our co-production of George’s Marvellous Medicine playing a large part in this achievement. 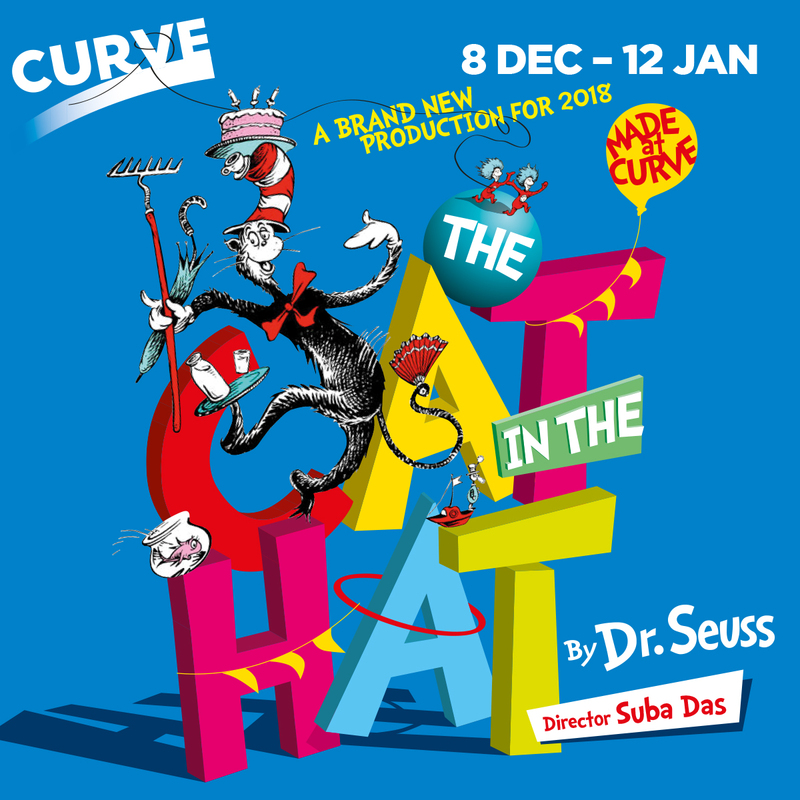 Tickets for The Cat in the Hat at Curve are on sale now and can be purchased online at http://www.curveonline.co.uk, over the phone by calling 0116 242 3595 or in person at Curve’s Ticket Office. Promo: Mark Gatiss interview. The Madness of George III. Nottingham Playhouse.